Representatives from Waseda University of Tokyo, Japan paid a visit to CTBC International Academy on Thursday, Oct. 11. The purpose of their time on campus was to give a lecture on studying at their institution for prospective international students. Waseda is a private university offering a range of undergraduate and graduate programs in Japanese and English. A significant number of CIA students are currently interested in and researching overseas universities, and at least two are keen on studying in Japan. 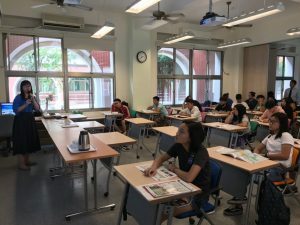 Studying at a university abroad is a dream for many Taiwanese students, but the hurdles to overcome to obtain this dream are many, including cost, secondary school performance, and language tests. Add to this list the challenge of moving to and living in a foreign country and culture and the prospect can be daunting. However, the payoffs can be huge. Studying abroad can be the adventure of a lifetime, with the chance to truly be immersed in a different culture, be surrounded by students from all around the world, strengthen language abilities, see more of a new country, and possibly stay and work in the country of study. The experience can give job-seekers an edge in a very competitive world, showing prospective employers a broader skill set and way of thinking than other applicants as well as demonstrating the commitment required to succeed at an institution far from home. How many high schools do you know of that can lay claim to having a hair salon and spa on campus? 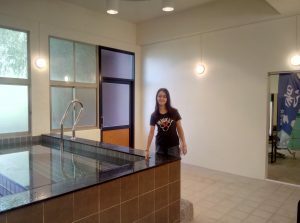 At CTBC International Academy, these amenities are part of an impressive array of facilities including a golf driving range, tennis courts, indoor gymnasium, and kayaking canal. Located in one of the as-yet unused buildings, the hair salon offers haircuts for as low as $100NT. For students living on campus, this service cannot be more convenient. As the CIA campus is in an area of Annan that is relatively far from restaurants and services, the hair salon is one convenience that students can take advantage of with ease. The hair salon is already a surprise but pales in comparison to the discovery that there is a large, Roman-style bath attached to the salon. Rising to about chest height, the two pools are lined with beautiful, smooth, blue tiles to provide a relaxing colour to enhance the soothing warm and cool water. Students are bound to enjoy soaking in the baths, especially in the cooler winter months.